When you think of meatballs what is the first thing that comes to your mind? I immediately think about spaghetti and meatballs. I think meatballs are most famous for pairing with spaghetti and since pasta is my favorite food it’s what comes to my mind. The next thing that comes to my mind is Italian Wedding Soup. Why? I worked at an Italian restaurant for 5 years and that was the soup that was always on the menu. So this week when I found out the Sunday Supper theme was meatballs I knew I had to come up with something better then pasta or soup. I don’t make a ton of meatballs so I started searching for recipes both online and in my cookbooks. Oh, did I mention I wanted the meatballs to be semi-healthy? 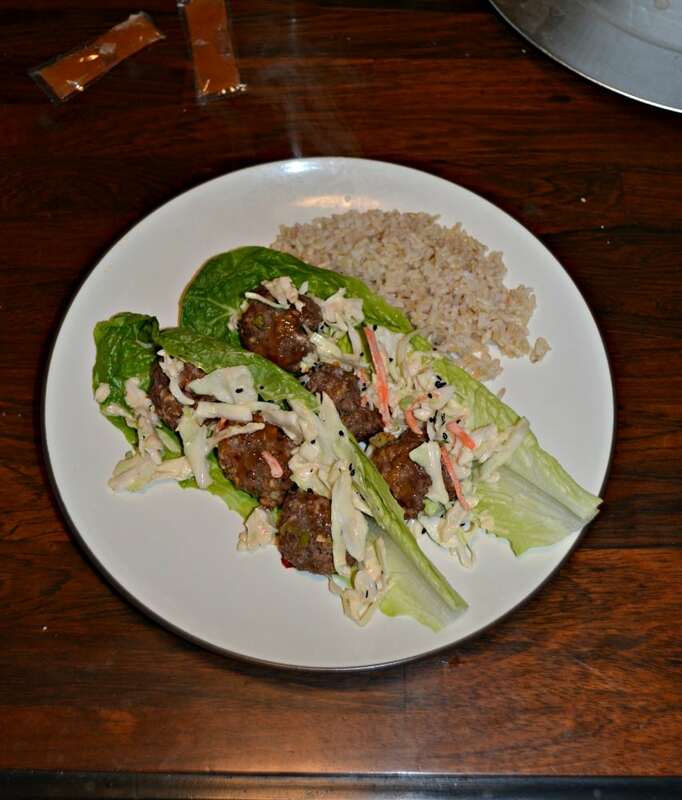 I found these Thai meatball Lettuce Wraps and I knew that was the recipe. The meatballs were made with lean ground beef, spices, and coated in Thai sweet chili sauce. They were served in either romaine or Bibb lettuce leaves, and then topped with coleslaw. If you’ve ever heard me talk about coleslaw you know I’m not a fan. 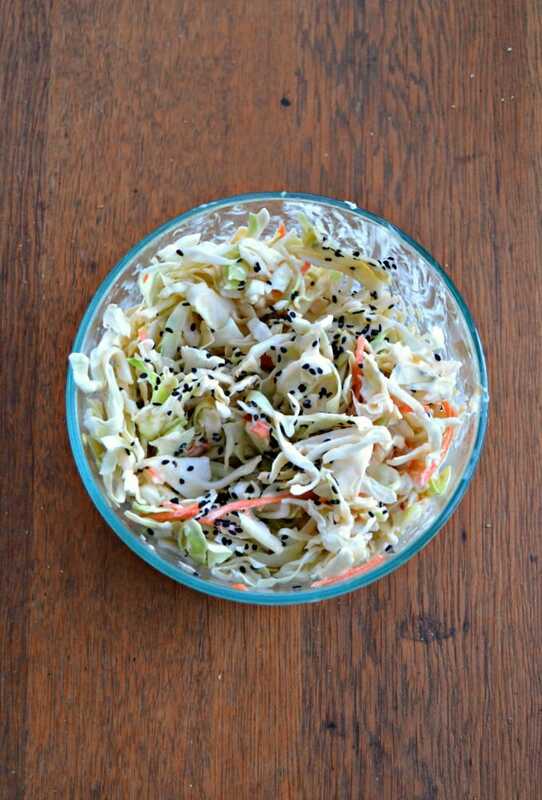 I chose this recipe because the coleslaw was Asian style with soy sauce, sesame seeds, rice vinegar, and mayonnaise. It sounded interesting and much better then traditional coleslaw. Since I like wraps with slaw on top I figured I’d give it a whirl. The day I ended up making these I was exhausted. I had several students having tough days which in turned caused me to have a tough day and by the time I got home I didn’t want to cook. However, when I looked at the menu I perked up a bit because I was really excited to try this recipe. 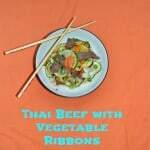 As a bonus it took less then 30 minutes start to finish so it was an easy meal to make! These lettuce wraps were amazing. I wish I had made a double batch so we could have had them the next night as well. The meatballs are baked in the oven and they are just slightly spicy, a little sweet, and full of tons of flavor. Then there is the slaw. Folks we have a winner! I could make this slaw and eat it beside my hamburgers or other summer foods because it’s delicious! There isn’t much mayonnaise so it’s not overly creamy. 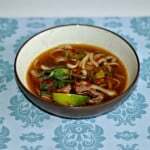 The rice vinegar gives it a slightly sour taste but the soy sauce takes the edge off of it. It tasted so good on top of those meatballs! 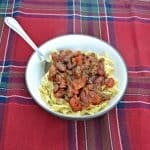 My husband and I both loved this meal and I can’t wait to make it again. I simple served it with rice and it was a complete dinner. I had my rice on the side for one wrap and in the lettuce wrap on the second one. I really like them with the rice inside. So if you are feeling adventurous and want to pair your meatballs with something other then pasta make sure you give these a try! 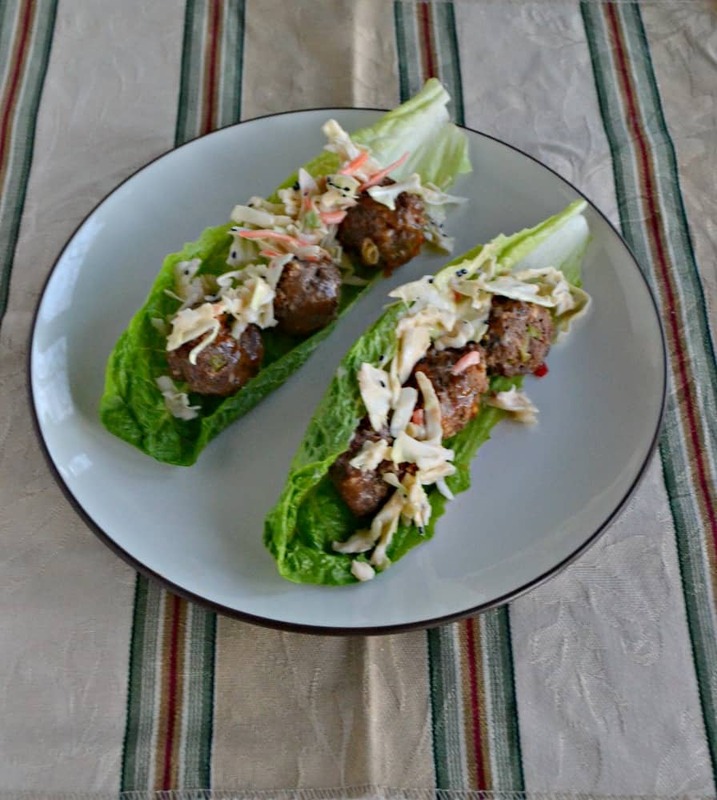 Don't pair your meatballs with pasta...make them with a sweet and spicy Thai sauce and put them in a lettuce wrap with fancy Asian slaw instead! Preheat the oven to 400 degrees. Spray a baking sheet with cooking spray. To make the meatballs, mix together the ground beef, scallions, ginger, garlic, soy sauce, Sriracha, and lime juice in a medium bowl using your hands. Using 1 tablespoon of the meatball mixture, form the meatballs and place them on the baking sheet. Bake the meatballs for 15-18 minutes, turning over after 10 minutes. Meanwhile, make the coleslaw by combining the coleslaw mix, basil, and cilantro in a medium bowl. Set aside. 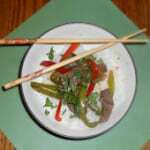 Combine the rice vinegar, mayonnaise, soy sauce, sesame seeds, and sweet Thai chili sauce in a small bowl. Whisk to combine. Pour the dressing over top of the coleslaw and toss to coat. When the meatballs are done transfer them to a medium bowl and toss with 2 tablespoons of Thai chili sauce. 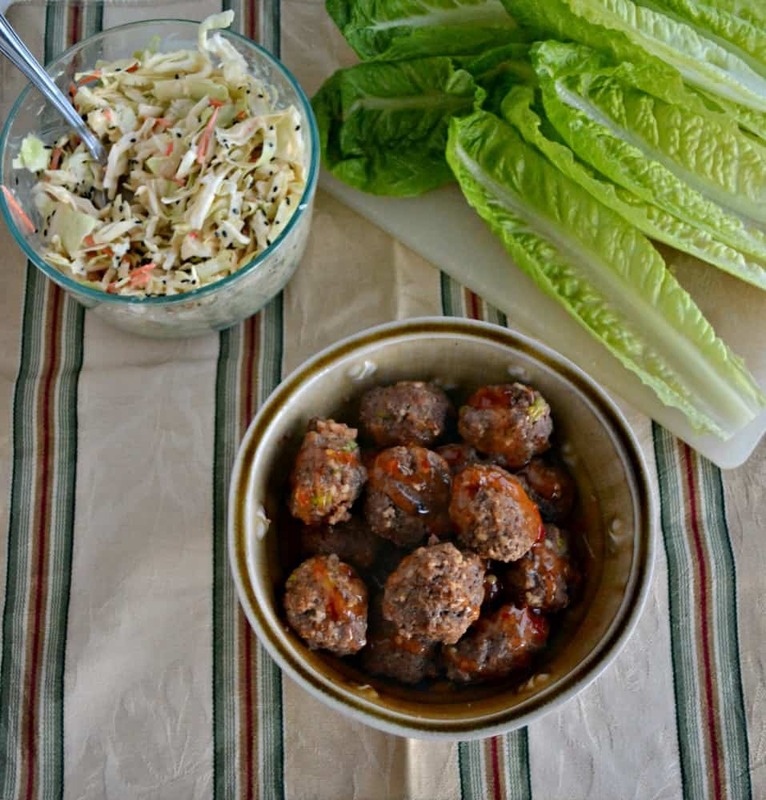 To assemble to wraps place a lettuce leaf on a plate, top with three meatballs and a few spoonfuls of the coleslaw. Sprinkle with cilantro or a squeeze of lime juice if desired. I love the thai sweet chili sauce- fabulous idea and why not in a lettuce wrap right?? Me too, it’s so good. As for the lettuce wrap, why not is correct! These are so my kind of meatballs! I wish I had some right now!! Now that is a healthy bite, great recipe!! Great idea, and I like the sound of that slaw, too. I love Thai meatballs! 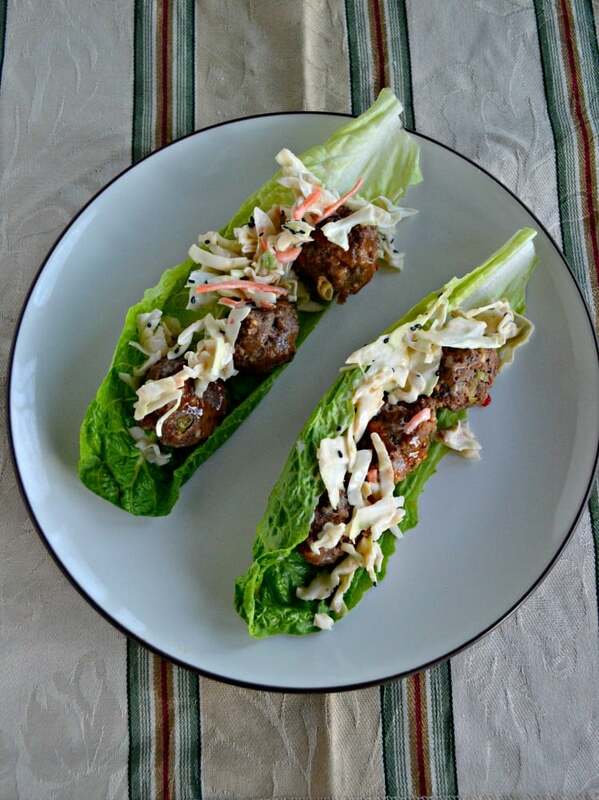 How perfect to have them as lettuce wraps!